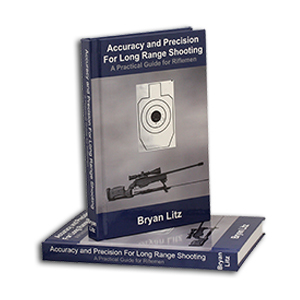 Many long range shooters consider “the Bryan Litz Books” required reading for anyone serious about long range shooting, whether you do it on a recreational or professional level. In his books, Bryan explains the complex science and theory behind shooting by using an easy to understand language so that any reader can pick up these books and improve their shooting capability. Over this series of books he covers everything from the mathematics behind shooting to the practical application of shooting techniques. Applied Ballistics for Long Range Shooting, Second Edition explains the important elements of exterior ballistics in a practical way that can be understood and applied by shooters. This book also offers an original contribution to the long range shooting sports: experimentally measured Ballistic Coefficient (BC) data for over 236 long range bullets of all popular brands. With truly accurate BC’s, shooters are empowered to make very precise trajectory calculations. Experimental test data on 61 additional bullets. Bullet data pages now include complete stability data. 42 more pages and larger 7×10 inch format. Two additional chapters plus expansion and correction of existing chapters. CD contains Version 2.0 of the Point Mass Ballistics Solver with most commonly requested upgrades. Plus ballistic performance analysis for both long range hunting and target shooting Applications. Preview Applied Ballistics for Long Range Shooting Second Edition here. 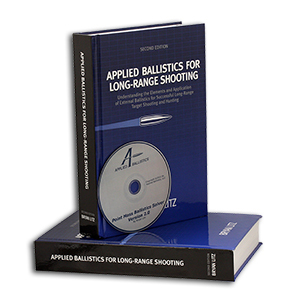 Purchase your copy of Applied Ballistics for Long Range Shooting Second Edition here. Accuracy and Precision for Long Range Shooting takes a step further than most other books to discuss how various uncertainties affect your hit percentage. It explains Weapon Employment Zone analysis and applies it throughout the book to show how effectiveness can be improved through various means. As with all of Bryan Litz’s books, it is written in an easy to understand language which makes it both enjoyable and effective. Bryan takes his very technical knowledge about long range shooting and communicates these complex ideas in layman terms so that most average shooters can master the subject with little difficulty. The book is broken into 3 parts: Precision, Accuracy and WEZ analysis. Preview Accuracy and Precision for Long Range Shooting here. Purchase your copy of Accuracy and Precision for Long Range Shooting here. Many topics are covered in this first volume, including the effects of twist rate on muzzle velocity, BC (supersonic and transonic), precision, even spin rate decay for various rifling profiles is tested experimentally. Other sections detail the evolution of modern rifle, bullet and optic design. Results from extensive chronograph testing are presented which show the strengths and weaknesses of available commercial chronographs. High tech instrumentation such as laser rangefinders and wind measurement devices are explained in detail by contributing author Nick Vitalbo. The series is heavily based in experimental ballistics, and takes a sort of ‘mythbusters’ approach to many of the questions and problems faced by modern long range shooters. In today’s world of marketing hype and movie magic, Applied Ballistics continues to explore long range shooting using the scientific method, and publishes the results in a non-biased way that can be easily understood by any shooter. Future volumes are planned to cover the ongoing testing and evaluation activities of Applied Ballistics. Preview Modern Advancements in Long Range Shooting here. Purchase your copy of Modern Advancements in Long Range Shooting: Volume 1 from buybergerbullets.com. This is a reference book that contains a chapter on how to use the data, then live fire test data on 400 modern rifle bullets. It is recommended that you first read Applied Ballistics for Long Range Shooting, Second Edition before using the data in this book. Modern rifles have reached an unprecedented level of accuracy. In many cases, the weak link in the chain of hitting targets is the trajectory modeling, which is based on bullet performance. Unfortunately, not all bullet companies are up to the task of providing highly accurate Ballistic Coefficients (BC’s). In many cases, slight inaccuracies in BC can be the cause of missing your target. Furthermore, a meaningful apples-to-apples comparison of bullet performance is not possible when the BC’s are determined differently by various brands. This book provides highly accurate ballistic performance data for 400 modern long range bullets from .224 to .408 caliber. The Ballistic Coefficient data is based on live fire testing methods which are repeatable within +/- 1%. By employing a common testing method for bullets of all brands, shooters are provided with consistent and accurate performance data which can be used to compare and select bullets, as well as to calculate accurate trajectories which put your shots on target at long range. Detailed stability data is also included which can be used to determine suitable twist rates for bullets in various environments. Click here for a complete list of the bullet included in this book. Order your copy of Ballistic Performance of Rifle Bullets from buybergerbullets.com.